This remarkable manuscript of majestic dimensions and with sumptuous illumination narrating the history of mankind from the Creation through the Roman Empire was made either for King Charles V or a member of his royal court. It presents a collaboration between the "scribe of the king" Raoulet d'Orleans and two artists specially favored by the king, the Master of the Coronation Book of Charles VI and one of his close collaborators. This is the most richly illuminated copy of the Histoire ancienne in existence with illustrations found nowhere else in the manuscript tradition. This remarkable manuscript of majestic dimensions and with sumptuous illumination narrating the history of mankind from the Creation through the Roman Empire was made either for King Charles V or a member of his royal court. It presents a collaboration between the "scribe of the king" Raoulet d'Orleans and two artists specially favored by the king, the Master of the Coronation Book of Charles VI and one of his close collaborators. This is the most richly illuminated copy of the Histoire ancienne in existence with illustrations found nowhere else in the manuscript tradition. Of dazzling provenance, beginning in the royal circle and ending most recently in The J. Paul Getty Museum, the present manuscript offers a rare opportunity to acquire a secular artistic work "created for someone highly placed in the French court." How suitable these textual and pictorial examples must have been for those in the royal circle of the Valois kings eager to affirm their own illustrious lineage by underscoring their ties to heroes of antiquity. 347 (194 +153) folios in two volumes, in gatherings mostly of 8, complete, written in dark brown ink in a handsome Gothic bookhand, on two columns of 52 lines (written space 295 x 202 mm., each column c. 90 mm. ), rubrics in red, line endings in red and blue, half fleurs-de-lis in blue and gold bordering columns of text (ff. 1 and 195), 2- to 6-line initials throughout in blue and burnished gold with red and blue pen flourishing, 3- to 6-line chapter initials (when introduced by miniatures) in blue and red with white tracery on burnished gold grounds in-filled with blue and orange foliage, one historiated initial and 76 column-wide miniatures with partial borders of gold red and blue bars with foliate extensions, 2 frontispieces, one with six miniatures and one with four miniatures in quatrefoil compartments with tricolor frames with nearly full illuminated borders, in excellent, fresh condition throughout, all leaves with wide margins, the miniatures brilliant and extraordinarily well-preserved, except for some minor abrasion to the two frontispieces, one of the four miniatures on f. 199 cut out and replaced c. 1470 (perhaps by the painter of Spencer 34 in the New York Public Library--a manuscript also owned by Jacques d'Armagnac). In modern bindings of dark blue-green Levant morocco by W. H. Smith & Sons (Douglas Cockerell). Dimensions, 400 x 285 mm, written space 295 x 202 mm. (each column approx. 90 mm.). 1. The layout of the text and the style of the decoration bear many close resemblances to the great historical works written and illustrated for King Charles V (reigned 1364-1380), in particular, the famous Grandes Chroniques de France (Paris, BnF, MS fr. 2813). 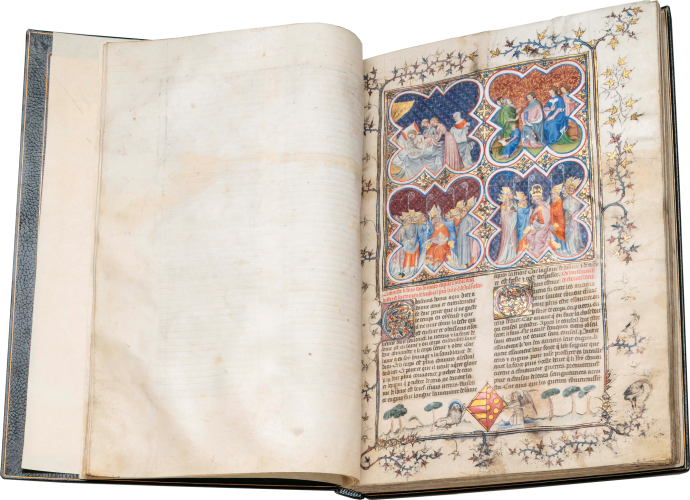 The manuscript is also closely related to another copy of the Histoire ancienne, dated 1364, which was owned by the other famous Valois bibliophile, Jean, Duke of Berry (Paris, BnF, MS fr. 246). These associations, as well as the evidence for the scribe and illuminators (see below), suggest that the manuscript was made for an important member of the royal court, if not for the king himself. 2. That it was earlier in the possession of either Jean of Berry or Charles V is further supported by the subsequent ownership of Jacques d'Armagnac, Duke of Nemours (beheaded in 1477), who inherited books from both libraries (see Leopold Delisle, Le Cabinet des Manuscrits de la Bibliotheque imperiale, vol. I, Paris, 1868, p. 86). Jacques d'Armagnac's coat of arms, as well as the twelve letters of his motto "FORTUNE D'AMIS," were painted on the fore-edges, with the letters arranged in an anagram as "IOAN" (top), "TEMS" (side), and "RDVF" (bottom, inverted; see Delisle 1868, p. 88). (The manuscript was at that time bound in only one volume, so for a complete picture of the arms and motto the two present volumes should he held together.) The duke owned two libraries, one at Castres, the other at Carlat. A partially erased inscription indicates that the present book is from the former library; it reads "Ce livre est au due de Nemours conte de la Marche. Jacques. Castres (f. 347)." As is characteristic of books from his library, there is a tally of the number of leaves and miniatures on the last page (f. 347v). 3. On each frontispiece there is a lozenge-shaped escutcheon, the first bearing the arms of Jean IV Raguenel de Malestroit and his wife Gilette, of the Combourg branch (f. 10, gules bezanty or, impaling quarterly 1 and 4 Brittany, 2 and 3 gules two bars argent), the second with the arms of their daughter Jeanne and her husband Tanneguy du Châtel, counselor and chamberlain to Louis XI (f. 199, barry of six, or and gules, a bordure counter-charged, impaling gules bezanty or, supported by a nimbed lion and an angel). Du Châtel was among those ordered to arrest the Duke of Nemours in 1476, but he died before the duke was condemned in July 1477. 4. Owned in the eighteenth century by the famous art collector Joseph Smith (1681- 1770), the British Consul in Venice, known more generally as "Consul Smith." At this time, the manuscript was reportedly in a "new" (i.e., eighteenth-century) brown calf binding in one volume. While Smith's first library was acquired en bloc by George III, this volume is found in the sale of his second library: London, Baker & Leigh's, 25 January 1773, lot 991 (to "Darker" for five guineas). 5. A. Chester Beatty (1875-1968), Western MS 74. Bought by Mrs. Beatty on 21 June 1923 from Bernard Quaritch as a present for her husband, as recorded in an inscription on the fourth flyleaf. By this time the present blue leather bindings replaced (presumably by Quaritch) the earlier brown calf bindings. The first Beatty sale, London, Sotheby's, 7 June 1931, lot 20 (to the Spanish Art Gallery). 6. William Randolph Hearst (1863-1951, his MS 8; Hearst was a renowned newspaper publisher, politician, and collector, who assembled a vast art collection ranging from Antiquity to nineteenth century and built Hearst Castle in San Simeon, in part to house the collection. 7. John A. Saks, with his bookplate; his sale New York, Christie's, 20 May 1983, lot 49 (to H. P. Kraus). 8. Martin Schoyen, Oslo and London, his MS 027. 9. Elizabeth J. and James E. Ferrell, USA. 10. Los Angeles, on long-term deposit J. Paul Getty Museum, 2004 to 2017; exhibited and published: Elizabeth Morrison and Anne D. Hedeman, Imaging the Past in France: History of Manuscript Painting 1250-1500, Los Angeles, J. Paul Getty Museum, 2010, no. 23.
ff. 199-347, Faits des Romains: Ci commence li fais des roumains compile ensamble de saluste et de suetonie et de lucan. Cil premiers livres est de Julius Cesar. Clearly of the highest quality, the script has been attributed to Raoulet d'Orleans (see F. Avril, Le librairie de Charles V, Paris, 1968, esp. p. 113 and nos. 189-197; an attribution accepted by Morrison and Hedeman, 2010,). A favorite of the Valois court, Raoulet flourished from 1360 to 1396 (see Bencdictins du Bouveret, Colophons, no. 162.85-296, for other works of his). For the career of Raoulet, see Rouse and Rouse, 2000, I, pp. 273-279. He frequently collaborated with the Master of the Coronation of Charles VI and his workshop. What is extraordinary about the illustration of the Histoire is that most of the added miniatures are found in the section of the text devoted to biblical stories. Certain scenes from the story of Joseph from the Book of Genesis, which comprises nine miniatures in total, are found in no other copies of the Histoire. Because of unique features in the representation of Joseph (as a wise old man, with a halo, etc. ), Morrison and Hedeman suggest that "the patron may have especially revered the wisdom or devotion of Joseph." The frontispiece of the Fait des Romains was repainted by artists who worked for Jacques d'Armagnac in the 1470s. The artists who worked on this frontispiece had access to a manuscript owned by the Duke of Berry that subsequently entered the collection of Jacques d'Armagnac (Paris, BnF, MS fr. 246). f. 44, Jacob and sons before Pharaoh: "Comment Joseph ala cen­tre son pere et I'emmena au Roy selonc la bible"
f. 170, Siege of Numantia: "Comment a ceste bataille fuissent desconfit le rommain se ne fust touz seuls scipio." f. 330, Two groups of knights confront each other: "Comment Cesar se combat au roy des hermines"
f. 346, Death of Caesar: "Comment li senatour occient cesar." In the details of the brilliantly executed miniatures, there is con­siderable evidence for situating this manuscript in the immediate milieu of Charles V, if not in the king's own library. In the tri­color frames of the frontispieces, in the wonderfully varied range of the backgrounds (especially in the square facets and the monochrome fleurs-de-lis), and in the pen-drawn marginal figures (see ff. 199), there are multiple resemblances to manuscripts of certain Valois provenance. Still more compelling is the collab­oration in these two volumes of several artists who also worked together on manuscripts that were made specifically for Charles V (see Avril, 1978, p. 34), most significantly the Grandes Chroniques de France (Paris, BnF, MS fr. 2813), which is not only one of the king's most celebrated manuscripts, but also a commission in which he took the greatest personal interest (see Hedeman, 1991, pp. 95-133). There are two hands responsible for the present manuscript. The first, a collaborator of the Master of the Coronation Book of Charles VI, was responsible for the frontispiece to the Histoire Ancienne (f. 10) and most of the miniatures of the Faits des Romains, while the second, the Master of the Coronation Book of Charles VI himself, painted the three original miniatures in the frontispiece to the Fait des Romains (f. 199) and most of the miniatures of the Histoire Ancienne. In terms of costume, figure types and the limited use of landscape elements, the two are quite similar, but whereas the first artist placed greater emphasis on line and color, the second uses slightly more painterly effects, which are especially evident in the subtly shaded modeling of the drapery folds. The first artist was more often dealing with battle scenes, and the strong contrast between the bright surcoats and pale gray armor of his soldiers stands out as one of his most characteristic traits (see. ff. 219 and 357v). Among the Histoire ancienne miniatures, the figures of the second artist are immediately distinguishable by their distinctive flesh-toned faces with white highlights (see f. 25). While these two artists do not appear to have worked on any of the other Histoire Ancienne manuscripts to which the present version is associated iconographically, their work is specifically related to the illustrations for the c. 1370 continuation of Charles V's Grandes Chroniques de France (Paris, BnF, MS fr. 2813, ff. 464-480; see Hedeman 1991, pp. 116-133), attributed to the Master of the Coronation of Charles VI and followers. The first artist (the artist of ff. 10, 219, and 357v) is undoubtedly the same as the "follower" who illustrated the section of the Grandes Chroniques that records the 1378 visit to Paris of Emperor Charles IV. Best known of his miniatures is that depicting Charles V's reception for the emperor and his son Wenceslaus in the grand hall of the Palais de la Cite (see F. Avril, Manuscript Painting at the Court of France, New York, 1978, pl. 34). He also painted the four-part frontispiece to Book I of Charles VI's Grandes Chroniques (Paris, BnF, MS fr. 10135, f. 3) in which there are several good comparisons to his handling of the battle scenes in the present manuscript (see Hedeman 1991, fig. 72). The work of the second artist is much closer to the famous coronation miniature, which was added to the beginning of the Grandes Chroniques, also probably in 1379 (Paris, BnF, MS fr. 2813, f. 3v). It is because this minia­ture was believed until recently to be a depiction of the corona­tion of Charles V's successor, that its artist is known as the Master of the Coronation of Charles VI (see Hedeman 1991, pp. 126-28, for the convincing argument that it actually depicts the coronation of Charles V). He was a member of one of the most skilled workshops of illuminators in Paris in the 13705, and, according to François Avril, he was one of the artists most favored by Charles V during the last ten years of his reign (Avril 1978, p. 109). When the manuscript was exhibited at the J. Paul Getty Museum in 2010, the authors concluded that "the style, script, and lavish program of illustration, and subject matter of the Ferrell manuscripts, illuminated in Paris in the third quarter of the fourteenth century … all point to the possibility that they were created for someone highly placed at the French court" (Morrison and Hedeman, no. 23). And, later "All these factors together suggest that the manuscript was made for someone of rank at the French court." E. G. Millar, The Library of A. Chester Beatty: A Descriptive Catalogue of the Western Manuscripts, vol. 2., 1930, no. 74, pp. 147-156, pls. 170-173. Seymour de Ricci and W. J. Wilson, Census of Medieval and Renaissance Manuscripts in the United States and Canada, vol. 2, New York, 1937 (repr. 1961), p. 1689, no. 8. D. J. A. Ross, Alexander Historiatus, London, 1963, p. 19. H. P. Kraus, Cimelia: A Catalogue of Important Illuminated and Textual Manuscripts Published in Commemoration of the Sale of the Ludwig Collection, Catalogue 165, 1984, no. 6. Doris Oltrogge, Die lllustrationszyklen zur "Histoire ancienne jusqu'a Cesar" (1250-1400), Frankfurt am Main, 1989, see esp. pp. 32-33, 47-49, 113-114, and 323-316. Gano Sorenssen, The Schoyen Collection: Checklist of Manuscripts 1-2393, Oslo, 1997, pp. 23-24 and color plate (f. 199). Elizabeth Morrison and Anne D. Hedeman, Imagining the Past in France: History of Manuscript Painting 1250-1500, Los Angeles, J. Paul Getty Museum, 2010, no. 23. Anne D. Hedeman, The Royal Image. Illustrations of the Grandes Chroniques de France 1274-1422, Berkeley, 1991. Please send me further information about this work. Thank you, your inquiry has been received.